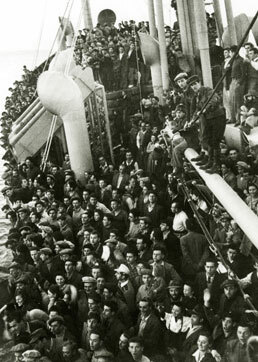 Turkey has just commemorated the Struma disaster, a tragic episode 74 years ago when a boatload of Holocaust survivors was sunk, violating Turkey's wartime neutrality. It is the second time the victims have been officially remembered and is seemingly part of Turkey's recent charm offensive towards the Jewish community and Israel. But anti-Semitism in Turkey has reached frightening levels of intensity, writes Burak Bekdil of the Gatestone Institute. "Writing anti-Israel speech on the wall [outside] of a synagogue is an act of anti-Semitism," said Ivo Molinas, editor-in-chief of Turkish Jewish newspaper, Şalom. "Widespread anti-Semitism in Turkey gets in the way of celebrating the richness of cultural diversity in this country. "...Turkey's sinking of the Struma ..."
The Struma was sunk by a torpedo fired from a Soviet submarine. It is not clear what motivated the Soviets to do this. There were standing orders to the Soviet Navy in the Black Sea to sink ships that might be hostile but the Struma hardly qualified to be put in that category. It is more likely that the sinking was carried out by the Soviets at the request of the British authorities. Here's a bit more about what happpened: The Turks towed the ship into the Black Sea where the ship was allowed to drift helplessly. After it sank no effort was made to rescue the survivors. Only one man survived, David Stoliar, who died in 2014. He was detained for many weeks after he came ashore.So the Turks could be said to be somewhat complicit in the tragedy.